This private Fixed-Base Operator (FBO) development at Fort Lauderdale/Hollywood International Airport is a 25 acre parcel that includes a three-story terminal/office, two (2) 40,000 square foot hangars, 240 parking spaces, native landscaping, retentions ponds and a fuel farm. The aircraft ramp area on the north side of the site connects directly to Taxiway “C” and the north runway. The modern terminal building includes a two-story, luxury passenger lounge and cafe waiting area which features angled glass facades to illuminate the interiors with natural daylight while keeping the interior cool through the strategic placement of shade louvres which wrap around the front of the building. All FBO staff functions are located on the west side of the terminal and all public functions are on the east side. 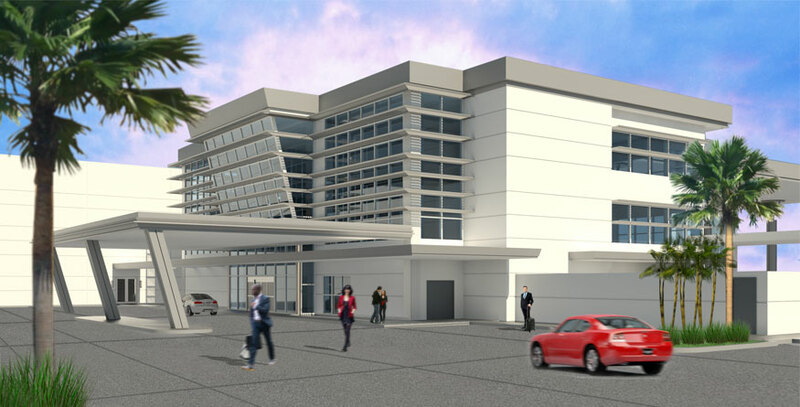 The second and third floors of the terminal building will accommodate rental spaces for tenants. The hangars will include 28 foot high, bi-parting hanging doors. The land side of the hangar will include a controlled core area with restrooms and a breakroom and will be flanked by numerous tenant spaces. Service areas, storage areas and similar functions will be housed in spaces in between the hangars and the terminal building will be connected with covered walkways.